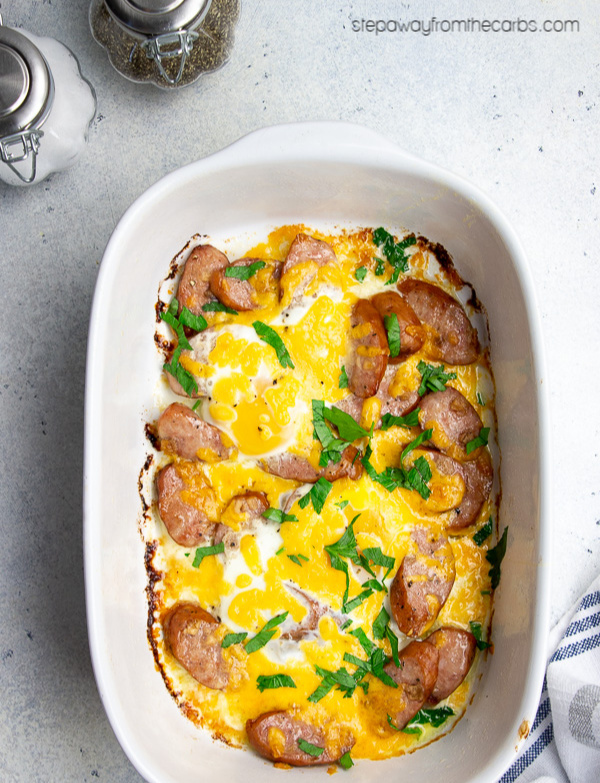 This rich and filling egg and sausage bake is the perfect breakfast or lunch. 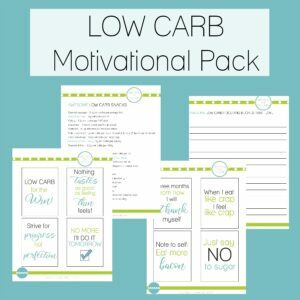 Low carb, keto, LCHF and gluten free recipe. 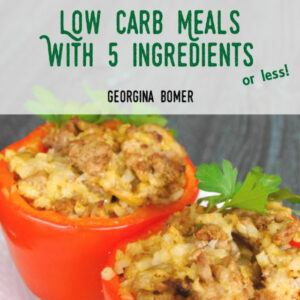 This super-low carb dish is something I often cook when I have a solo lunch at home. Getting the right sausage is one of the most important parts – and making sure that the carb content of the sausage is low. A good quality sausage without extra items like apple may not contain any carbohydrates at all. Spicy sausages work really well in this dish but I have also been known to add some red pepper flakes instead! Watch the recipe video tutorial or scroll down for the full instructions and printable recipe card! Chop two cooked sausages and place them in a small baking dish that has been sprayed with non-stick spray. Add a dash of heavy cream and crack two eggs over the top, trying not to break the yolks! Bake it in a preheated oven for 10 minutes, then add some shredded cheese over the top. An Italian or Mexican blend works well! Return it to the oven for another 10 minutes or until the egg whites have cooked. 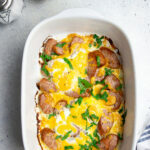 The combination of meat, cheese, cream and gooey egg is fantastic! You can enjoy it on its own, or perhaps serve it with some low carb tortillas and make some brunch wraps! Or if you’re having it for lunch, a crisp salad on the side would be perfect! 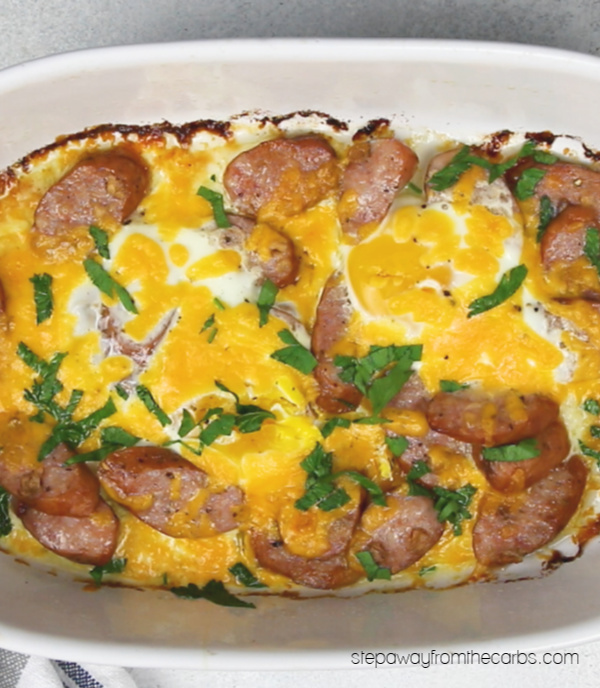 Place the chopped sausage and cream in the base of a small baking dish. Crack the eggs over the sausages, keeping the yolks whole if possible. Bake for 10 minutes, add the cheese, then bake for another 10 minutes or until the egg white has cooked. 0.6 net carbs per serving (Half the recipe). Always check the carb content of sausages and try to buy those that are 1g net carb or less per link. Made this today. My husband and I both really enjoyed it. I made it for him as written and I made myself the recipe with one egg. 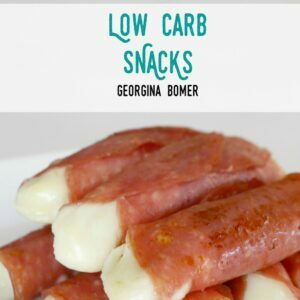 Very yummy and easy. Fantastic news – thanks for letting me know!